Coca-Cola and SeaWorld® at Regal Cinemas®Sweepstakes & IWG – Win a trip to each SeaWorld location! 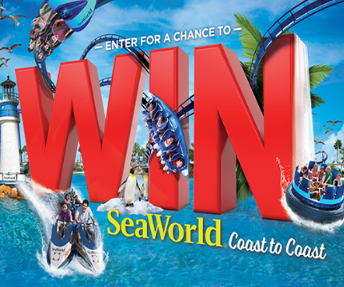 Win 3 trips (one for each of the different SeaWorld locations)! ENTER SWEEPSTAKES HERE – SeaWorld Sweepstakes page. ENTRY LIMIT – Limit: 1 Sweepstakes entry and 1 Instant Win Game play per person per day. SWEEPSTAKES ENTRY PERIOD – The Promotion begins at 12:00 a.m. Eastern Time (“ET”), May 25, 2018 and ends at 11:59 p.m. ET, June 28, 2018. Up to $20,000 (less if winner is unable to take all 3 trips in one year). the winner’s residence, winner will be provided $200 in spending money for driving expenses in lieu of air transportation. 100 FIRST PRIZES: A pair of tickets to any SeaWorld park, terms and conditions apply. 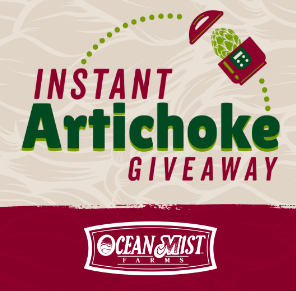 Ocean Mist Farms Instant Artichoke Giveaway – Win an Instant Pot & more! Win an Instant Pot Duo 6-qt. and more (18 winners)! ENTER SWEEPSTAKES HERE – Ocean Mist Farms Sweepstakes page. SWEEPSTAKES ENTRY PERIOD – Instant Artichoke Giveaway (the “Promotion”) commences at 12:00:01 AM Pacific Time (“PT”) on April 30, 2018 and ends at 11:59:59 PM PT on June 22, 2018. PRIZES – Eighteen (18) Prizes consisting of: an Instant Artichoke Prize Pack, which includes Instant Pot® Duo 6-Quart, green tongs, artichoke hand towel, artichoke apron, a serving platter, and a crate of premium Ocean Mist Farms artichokes. The approximate retail value (“ARV”) of each Prize Pack available to be won in this Promotion is $220.39 USD. 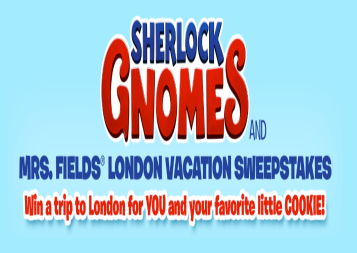 Sherlock Gnomes and Mrs. Fields Sweepstakes – Win a trip to London & more! Win a trip to London & more! ENTER SWEEPSTAKES HERE – Mrs. Fields Sweepstakes page. ENTRY LIMIT – The Sweepstakes is limited to one (1) Entry per person/email address per day. ELIGIBILITY – SWEEPSTAKES ENTRANTS MUST BE U.S. CITIZENS WHO ARE LEGAL RESIDENTS OF THE CONTINENTAL UNITED STATES (EXCLUDING RHODE ISLAND) AND AT LEAST TWENTY-ONE (21) YEARS OLD AT TIME OF ENTRY TO BE ELIGIBLE. SWEEPSTAKES ENTRY PERIOD – The Sweepstakes begins at 12:00 AM Eastern Standard Time (“EST”) on May 29, 2018 and ends at 11:59:59 PM EST on June 26, 2018. FIVE (5) SECOND PRIZES: Each Second Prize consists of one (1) twenty- five dollars ($25.00) Mrs. Fields Gift Card and one (1) Sherlock Gnomes Blu-rayTM DVD/Digital HD combination. ARV of each Second Prize: $56.99. John Soules Foods Father’s Day Giveaway – Win a Traeger Elite Pellet Grill! Win a Traeger Elite Pellet Grill! ENTER SWEEPSTAKES HERE – John Soules Foods Facebook page. ENTRY LIMIT – Entrants are limited to one (1) entry per Facebook account during the Contest period per day. ELIGIBILITY – The Contest is open only to legal residents of the United States of America, 18 years or older at the time of entry. SWEEPSTAKES ENTRY PERIOD – The contest begins at 12:01 a.m. CST on 5/18/2018 and runs through 11:59 a.m. CST on 6/17/2018. PRIZES – 2 daily John Soules Foods coupon winners – 3rd Prize is one (1) Yeti Tundra 75 – 2nd Prize is one (1) XLarge Big Green Egg – 1st Prize is one (1) Traeger Select Elite Pellet Grill. 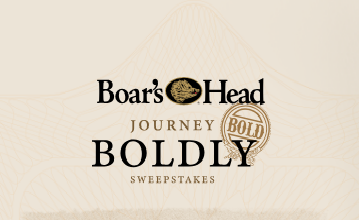 Boar’s Head Journey Boldly Sweepstakes – Win $10,000! ENTER SWEEPSTAKES HERE – Boar’s Head Sweepstakes page. ENTRY LIMIT – When you have collected all four (4) stamps detailed above, you will receive one (1) Sweepstakes Entry. When you collect all four (4) stamps and receive your first entry, you will be asked to register by supplying your first name, last name, ZIP Code, age range, and a valid, working email address for which you are the authorized user. You will then be given an opportunity to share the Sweepstakes on Facebook and/or on Twitter by clicking through either of the two links that will be provided. If you share on either one of those sites you will receive one ( 1 ) additional entry into the sweepstakes. You may share on both sites, but you will only receive ( 1 ) additional entry. There is a maximum of two ( 2 ) Sweepstakes Entries per person or email address during the Sweepstakes Period. ELIGIBILITY – This Sweepstakes is open only to legal residents of the U.S.A (excluding the State of North Dakota) and Puerto Rico, 18 years of age or older and the age of majority in their state of residence (19 in Alabama and Nebraska; 21 in Mississippi) as of date of entry. SWEEPSTAKES ENTRY PERIOD – The “Sweepstakes Period” is from 12:00:01 AM Eastern Time (“ET”) May 2, 2018 to 11:59:59 PM (“ET”) July 31, 2018. PRIZES – (1 ) Grand Prize: The ARV for an “Around-the-World” trip for two (2). The prize will be awarded as check for $10,000 payable to the Grand Prize winner to purchase his/her own trip. ARV: $10,000. Weekly Drawing ( four ( 4 ) per week for 13 weeks): One (1) American Express $25 Gift Card subject to all its Terms and Conditions, including expiration date. ARV: $25 each. 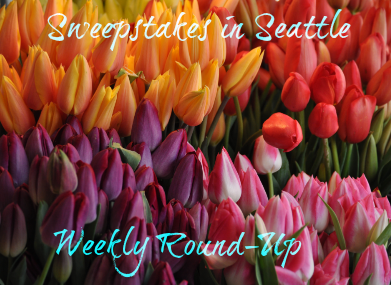 Sweepstakes in Seattle Weekly Round-Up 5/27 – Win $50,000, a trip to Texas, gift cards & more! We are enjoying a gorgeous weekend in Western Washington! Blue skies, sunshine and gentle breezes – I am loving every minute of it! I’m gearing up for a very busy week, but I will try to get some sweepstakes posted, so be sure to check back this week for new sweepstakes. Let me know if you won a prize recently and I’ll share it on the next weekly round-up! 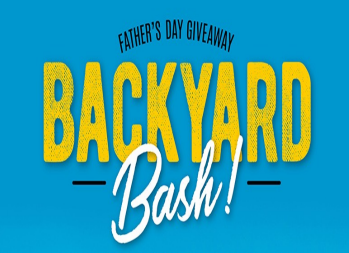 Ball Park® Buns Coca-Cola® Better Together Backyard Sweepstakes – Win a 43″ Outdoor TV & more! Win a 43″ Outdoor TV, an Amazon Echo & more! 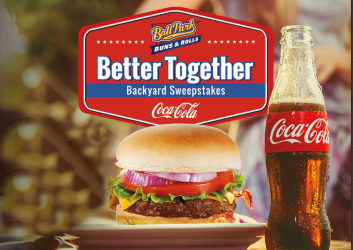 SWEEPSTAKES ENTRY PERIOD – The Ball Park® Buns Coca-Cola® Better Together Backyard Sweepstakes (the “Sweepstakes”) starts on April 30, 2018 at 12:00 a.m. Eastern Time (“ET”) and ends on July 8, 2018 at 11:59 p.m. ET. PRIZES – GRAND PRIZES (2): Each winner will receive a 43” outdoor television, an Amazon Echo device, a Ball Park® and Coca-Cola® branded grill spatula, a Ball Park® tumbler, Ball Park® Buns for one (1) year in the form of (52) coupons, each redeemable for a package of Ball Park® Buns up to $4.00 in value, and Coca-Cola® product for one (1) year in the form of (52) coupons, each redeemable for a Coca-Cola® product up to $4.99 in value. The Approximate Retail Value (“ARV”) of each Grand Prize package: $2,106.48. WINNER’S LIST – For the names of the winners (available after July 19, 2018) send a self-addressed, stamped, envelope by August 19, 2018, to: Ball Park® Buns Coca-Cola® Better Together Backyard Sweepstakes Winners, Balcom Agency, 1413 Rio Grande Ave., Fort Worth, TX 76102. HGTV Find More Texas Sweepstakes – Win a trip to Texas! 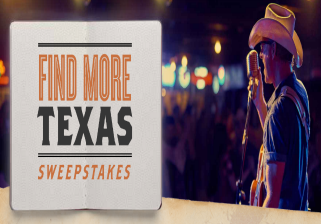 Win a trip to Texas! ENTER SWEEPSTAKES HERE – HGTV Sweepstakes page. Travel Channel Sweepstakes page and Food Network Sweepstakes page. ENTRY LIMIT – Limit of one (1) entry per person, per day on the HGTV Website, one (1) entry per person, per day on the Food Network Website and one (1) entry per person, per day on the Travel Channel Website. ELIGIBILITY – This Promotion is open only to legal residents of the contiguous 48 United States and D.C., excluding Texas, who are 21 years of age or older as of the Promotion start date. SWEEPSTAKES ENTRY PERIOD – Beginning at 9:00 a.m. Eastern Time (“ET”) on May 15, 2018 until 5:00 p.m. ET on July 13, 2018. PRIZES – The Grand Prize Winner will receive their choice of one of the following vacation packages (the “Grand Prize”): (i) a trip for two (2) to Austin, Texas; (ii) a trip for two (2) to Dallas, Texas; or (iii) a trip for two (2) to Houston, Texas. 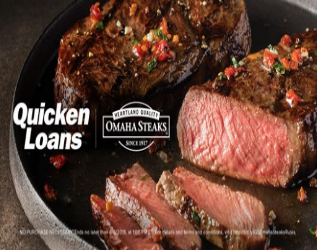 Quicken Loans and Omaha Steaks High Steaks Sweepstakes – Win Omaha Steaks & a Chest Freezer! Win Omaha Steaks & a Chest Freezer! ENTER SWEEPSTAKES HERE – Quicken Loans Quikly Sweepstakes page. ENTRY LIMIT – Limit: One (1) registration and/or entry per person/email address/phone number for the entire Promotion Registration and Entry Period. ELIGIBILITY – The Promotion is open only to legal residents of the fifty (50) United States and the District of Columbia who are at least eighteen (18) years old at the time of entry and located in the United States at the time of entry, and have a mobile device with a valid phone number. SWEEPSTAKES ENTRY PERIOD – The Promotion registration and entry period begins on May 21, 2018 at 11:00:00 a.m. Eastern Time (“ET”) and ends as soon as the live release occurs, which will be no later than June 6, 2018 at 1:00:00 p.m. ET. -Bone-In Rib Roast 6 lb. -Bone-In Beef Short Ribs 2 lbs. -Premium Ground Beef 20 lbs. -Beef Brisket Roast 2 lb. -Boneless Chicken Breasts 12 (4 oz.) | 3 lbs. 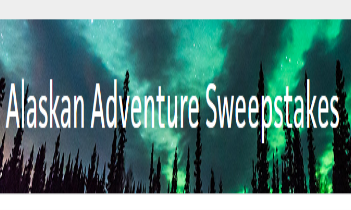 Travel Channel’s Alaskan Adventure Sweepstakes – Win $10,000! ENTER SWEEPSTAKES HERE – Travel Channel Sweepstakes page. ENTRY LIMIT – There is a limit of one (1) entry, per valid email address, per eligible person, per day. SWEEPSTAKES ENTRY PERIOD – Beginning at 9:00 a.m. Eastern Time (“ET”) on May 15, 2018 until 8:59 a.m. ET on July 2, 2018. PRIZES – The Grand Prize Winner will receive the following (the “Grand Prize”): Ten Thousand Dollars ($10,000) presented in the form of a check. Approximate retail value (“ARV”) of the Grand Prize: $10,000.